Physicists today and the theories they currently elaborate are seemingly entrenched in one major idea: that the Big Bang occurred once in a moment of singularity (infinitely dense Universe) and has expanded ever since. Christof Wetterich, a theoretical physicist at the University of Heidelberg in Germany, has an alternate view. He believes the Universe is not expanding, and that all particles in the Universe are increasing in mass, which would explain why galaxies are shifting away from us. To tell if an object is moving towards or away from Earth, astronomers study the light emitted by these objects. This light has a characteristic frequency (color), depending on the object itself and what gets absorbed or not. When matter is moving away from us, these frequencies appear shifted towards the red, or lower-frequency, part of the spectrum (redshift), and when matter is moving towards us, these frequencies are shifted towards the blue, higher-frequency, part of the spectrum (blueshift). This is called the Doppler effect, and we all experience it each day (i.e. the sound a car makes when it rushes towards us is lower pitched than the sound the car makes after it drives past us). In the 1920s, Georges Lemaître and Edwin Hubble found that the light emitted by galaxies was red-shifted, which later helped them elaborate a landmark paper in cosmology today that claimed the Universe is expanding. The characteristics of light, however, are also governed by mass. If an atom were to grow in mass, the photons it emits would become more energetic. Because higher energies correspond to higher frequencies, the emission and absorption frequencies would move towards the blue part of the spectrum. Conversely, if the particles were to become lighter, the frequencies would become redshifted. Here’s where Wetterich idea becomes interesting. Einstein’s Theory of Special Relativity states that the speed of light is finite and that nothing can travel at a higher velocity than it. This means that the light we’re seeing or receiving from distant objects is like a history book or better yet a form of time capsule – we can only see it as it would have been at the time of emission. Sometimes, light can take billions of years to reach us and in the meantime the object that emitted the light might no longer exist today, for instance. If all masses were once lower, and had been constantly increasing, the colours of old galaxies would look redshifted in comparison to current frequencies, and the amount of redshift would be proportionate to their distances from Earth. Thus, the redshift would make galaxies seem to be receding even if they were not. 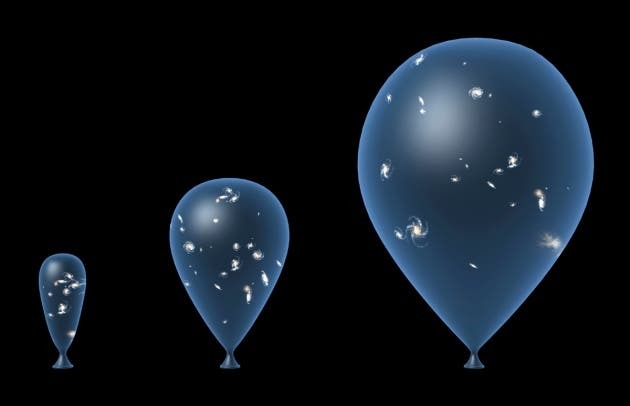 With this in mind, if we were to consider that the mass of all matter is constantly increasing, after doing the math we get that the Universe still expands rapidly, but only during a short-lived period known as inflation. But prior to inflation, according to Wetterich, the Big Bang no longer contains a ‘singularity’ where the density of the Universe would be infinite, and which has been giving physicists headaches for years trying to make sense of an event where the General Theory of Relativity doesn’t stand anymore. In Wetterich’s model, the Big Bang stretches out in the past over an essentially infinite period of time, meaning the cosmos could be static, or even beginning to contract. Newton would had been pleased. There’s one big problem with this theory though, despite no physicist has yet to refute it as totally implausible yet – it can not be tested. Mass is what’s known as a dimensional quantity, and can be measured only relative to something else. For instance, every mass on Earth is ultimately determined relative to a kilogram standard that sits in a vault on the outskirts of Paris, at the International Bureau of Weights and Measures. If the mass of everything — including the official kilogramme — has been growing proportionally over time, there could be no way to find out. Nevertheless, the theory still remains very fascinating and for one it offers an alternate cosmological model where no singularity exists, which would come at a significant advantage. If anything else, though, the theory remains valuable in itself since it offers an alternate picture of our Universe, one that might stir other physicists to think outside the box a bit and challenge our current accept cosmological Big Bang centered model. After all, it’s still just a theory. It would be really disappointing if it were wrong and we all concentrated our efforts modeling the world around it.